When you choose an HVAC company for residential heating and cooling service, of course you’re searching for a company that does the job right while providing excellent service. We pride ourselves on offering this combination of traits at Halo Heating & Cooling in Nashville, TN. At the same time, we know that none of that really matters if the price is too high. That’s why we offer an affordable price on our services, ensuring that everyone can have access to the HVAC service — including installation, maintenance and repair — they need. Plus, we offer a great HVAC service deal in Nashville to make the price even lower! Keep reading to learn all about it. Then, when you call to set up a service visit, mention the coupon on the phone. Get in touch by calling (615) 383-4822 or filling out our website form. So what’s the great deal we offer? 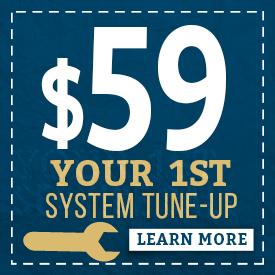 We will provide your first system tune-up for just $59! That’s an amazing price! After your initial tune-up, we’ll provide a check and tune-up twice a year for just $49 per unit — that’s still a great deal! The system check includes a thorough 21-point system inspection. Having your systems checked twice a year is recommended to make sure everything is working up to par, and to check for easy fixes we can make before a small issue turns into a big problem that would end up costing much more. You can ensure that you have a comfortable home all year long, whether the air outside is hot or cold. When you’re a member of our Halo Comfort Club, we treat you like a VIP with priority for heating and air repair and service. Better yet, you can expect an additional heating and air conditioning repair discount from our Nashville company — we will take 10 percent off any repair work when you sign up for the Halo Comfort Club! This is a great way to save on that repair you’ve been postponing! Our technicians provide an exceptional level of service, all at an affordable price. We send technicians who have been screened, have the required knowledge and experience, and arrive in uniforms. We offer a 100 percent satisfaction guarantee and a two-year workmanship warranty for every visit. Keeping up with ongoing maintenance will help you cut down on costs by keeping your system running efficiently and preventing large problems. Nonetheless, don’t hesitate to come to us for emergency repair if you ever need it. Our technicians take care of it all. Sign Up to Use Your Coupon! Ready to take advantage of your heating and cooling coupon at your Nashville home? Simply give us a call at (615) 383-4822 or contact us through the form on our website. Don’t forget to mention that you’d like to be part of the Halo Comfort Club and you’re ready to use our Nashville heating & air company special for a $59 system tune-up. We’ll send a qualified contractor right over to help your HVAC systems run at their best!